Kitchen Design Edinburgh are a small fitted kitchen design company but we also carry out other joinery work. We specialise in producing high quality kitchens and all types of internal joinery. We have a proven track record in beautiful and stylish fitted kitchens, bathrooms and bedrooms. 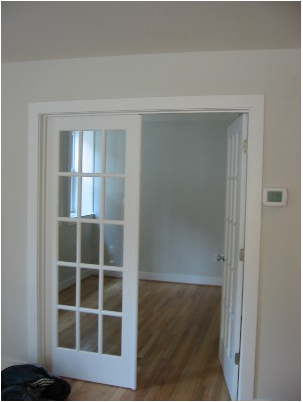 Other projects include hardwood floors, doors, bookcases, shelving and radiator covers. These are a few examples. If your project is not mentioned please ask. Most of our work as fitted kitchen designers and joiners is based in Edinburgh, East Lothian and the immediate surrounding areas. The majority of our furniture is manufactured in Scotland. Although much of our work is in private domestic homes we also carry out projects in offices, churches and shops. We have been carrying out work for many years in The National Library of Scotland. Our work as fitted kitchen designers has enabled us to gain repeat custom from domestic customers to UK based commercial bodies. Recently, we have gained expertise in designing bathrooms and bedrooms as well as being kitchen designers. We do welcome clients who like to work with us to get the finished project as they envisage. We provide a complete service from drawings to completion with all associated trades. All works are supervised. Kitchen Design in Edinburgh, Joinery Services in Edinburgh, Bathroom Design in Edinburgh, Kitchen Design in Lothian, Joinery Services in Lothian, Bathroom Design in Lothian.